Extract of 'Memories of My Life by Ella Anway, written in 1937. The two Anway brothers came to the United States from Wales about 1810, before the War of 1812. One settled near Buffalo, New York, and the other went south to New Orleans. We have heard that he raised a large family there. The one in Buffalo took up land there, married and had a family of seven boys and two girls. He sold his farm in New York and moved to Ohio hear Tiffin; when the counties were laid out he was given the honor of naming the new county, which he called Seneca County for the Lake and a Tribe of Indians in New York near his old home. His farm near Tiffin was large. His boys were named: William, John, Harvey, Austin, Harrison, Erastus and George. The two girls were Eunice and Fannie. Fannie married a man by name of Davis and they had twin babies. The boy was named Harrison Dell and the girl Harriet Bell. Harvey Anway married twice in Ohio. His first wife died leaving a boy named Silas and three girls, Bethana, Eunice and Phoebe. The children were taken by their grandmother who raised them. Harvey then married Marie Lewis. Her children were: Eliza, Almira, Joan, John, Charlie, Zella and Fannie (called Dolly). The four younger children were born after the family moved to Michigan near Lake Odessa, not far from Lansing, the capitol. They had a tract of land there; mostly of hard wood timber. They lived there four years, but when the gold excitement of Pikes Peak came he grew tired of the long, cold winters and sold his farm. John Wesley Anway was born near Lake Odessa, Michigan, in 1854. His parents, Harvey Anway and Marie Lewis Anway moved to Michigan from near Tiffin, Ohio. The Anway family left Michigan for Iowa where they lived several years near Adell, Dallas County. They sold out and started across the plains to Colorado with a large family in two wagons drawn by horses. They went to Colorado City and traded one team for what was called "The Fort", a large two-story log building with a ten foot stockade surrounding it. He opened it for the first Hotel in Colorado City and ran it for a few years; then moved to a ranch near Florrisant thirty-five miles west of Colorado City. The boys, John and Charley, grew to manhood there. Charley moved to the North Fork Valley in 1885 and took up land on Anway Mesa, now called Stewart Mesa, but recorded in Charley's name. John followed in 1886 and settled on part of Charley's land, now owned by Mrs. George Reynolds. Their only neighbor for a while was Wesley Ault. Then Marvin Stewart and family came in 1893. In 1893 John Anway married Mrs. Ella M. Chase and they lived on the ranch until 1897, when they sold to George Reynolds. They had one daughter, Mildred Margaret, born in Hotchkiss, Colorado on October 9, 1895, now Mrs. Arthur King of Los Angeles. Mr. John Anway died on April 27, 1935 in Alhambra, California, leaving his wife and daughter, two grandchildren and four step-children to mourn his loss. His brother Charley lives in Haines, Alaska. The other members of the family are all gone. Once again the Old Colorado City History Center and its Web Site have helped unearth new history about the earliest days of Colorado City's existance. We received an email from a Mrs. Joanne James, asking whether we knew where a hotel which was also called the Hotel Fort might have been in Colorado City around 1868. That a story had been passed down from her great grandmother that Henry Anway came to Colorado City, traded a team of horses for a hotel and operated it for several years. Yes we did, in fact. At 2818 West Pikes Peak, there is a granite marker with bronze plaque erected by the State Historical Society in front of an old house that stated it was the location of the Fort where women and children hid out when the Indians raided the area, killing the two young Robbins boys, and Charlie Everhart, in 1868. What we did not know was how Harvey Anway came to posses the Fort, which was a house hotel sort of or anything about him or his family. 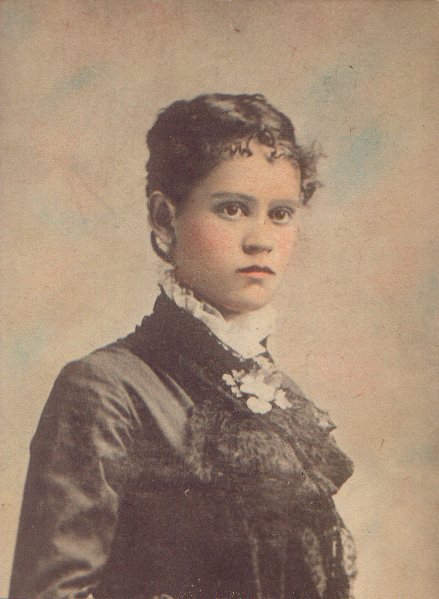 Mrs. James was thrilled, said she had a manuscript written by her great grandmother Ella Anway in 1937 which told of the exiting times her family had travelling through the West, and in a short section, told of Harvey Anway coming to Colorado City, trading for the hotel and operating it for several years. And she had a picture of Harvey and herself. So she came to our History Center from out of town, gave us a copy of the valuable manuscript, and we made a copy of the picture of Harvey Anway. In turn we showed her The Fort and marker in front of it, told her how, in 1868, when the Indians were on the warpath, killed Charlie Everhart, and the Robbins Boys, all the women and children of tiny Colorado City slept in it for protection. The fort was just the two story structure, but with a palisade of logs around it. Mrs Joanne James, Great, Great Grandaughter of Harvey Anway in front of the 1937 State Historical Society Marker and the House/Fort behind it.